After yesterday’s romp to Wisdom’s, we decided for a more sedate approach to our ride. Destination: San Xavier Mission in Tucson. It’s a wonderful ride – lots of uphill then a very long, smooth dowhhill for about 7 miles to the Mission. 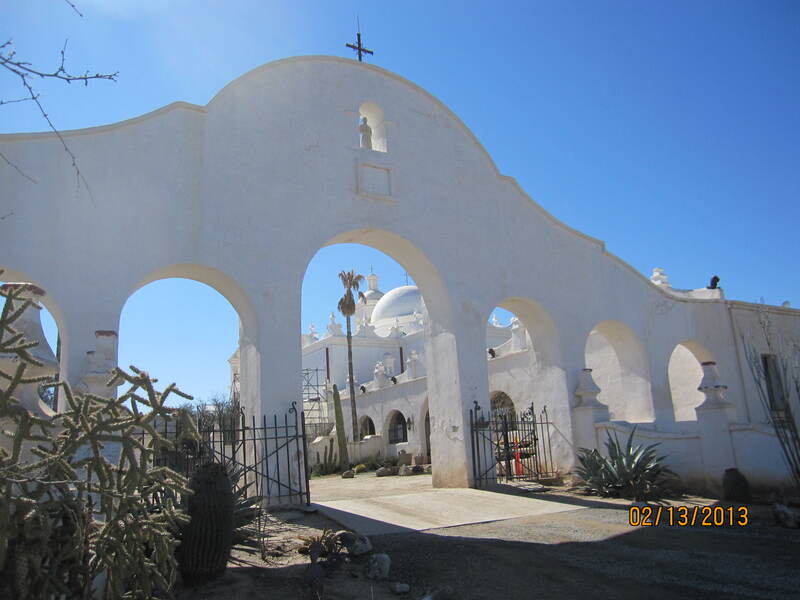 San Xavier was built by the Franciscans between 1783 and 1797. It’s known as the White Dove of the Desert, and is highly visible along I-19 between Tucson and Green Valley. The Mission is in a constant state of renovation, and the elaorate decorations and paintings are beginning to shine again. It’s an inspiring site. We were somewhat disappointed to realize that we had picked Ash Wednesday for our trip, and (naturally) arrived 15 minutes before the beginning of the noon service. Bummer. But, we did wander around, take photos, and visit the gift shop (of course!) before heading off again. John steered us toward a taco truck for lunch. We’ve ridden past this truck for years, but had never stopped. We’ve missed lots of good lunches! We feasted on burros, tacos, and the Ash Wednesday special, a calabasa/corn burrito. Wonderful eats. Here are a few more photos of the Mission, and some of the surrounding area. We don’t look as cold, do we? It’s beginning to warm up a bit. This entry was posted in cycling, retirement, Uncategorized and tagged Arizona, cycling, historic sites by Judy Crankshaw. Bookmark the permalink. You’d be surprised, Gary. It’s much more tender than donkey or mule.